The vapour steams produced in the evaporator when the solution is flashed are used to preheat the circulating solution. At the end of preheating, the energy is supplied in the form of exhaust steam and/or live steam. 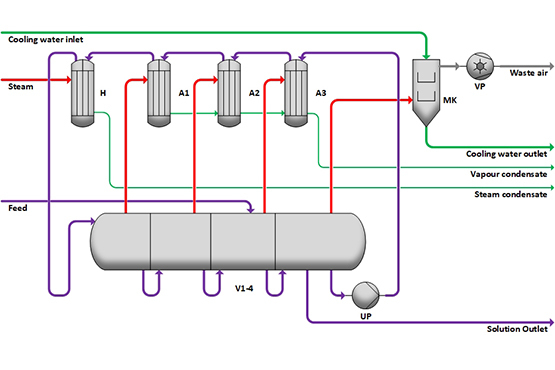 The solution is fed into a certain stage of the evaporator V1-4 and mixes there with the circulating solution. From the last stage of the evaporator, the solution is pumped with the circulation pump UP through the reboilers A3, A2, A1 and warmed up with vapour steams from the evaporator V1-4. At the end of the warm-up section, energy is supplied to the heater H in the form of exhaust steam and/or live steam. The solution then passes through the evaporator stages. Here, the solvent (water) evaporates gradually under decreasing pressure when the solution cools down to the boiling temperature. The resulting vapor steam is used in the heaters to heat the circulating solution. The vapour steam of the last stage is condensed with cooling water in the mixing condenser MK. The inert gases are extracted with a vacuum pump VP. The concentrated solution flows out of the system from a certain stage of the evaporator depending on the desired temperature. Economical with relatively low concentration in relation to the input quantity. Low steam consumption, depending on the number of stages and temperature gradient between first and last stage of the evaporator. The actual vapour evaporation does not take place on the heating surfaces of heat exchangers, which largely eliminates heating surface incrustation. This results in maximum operating times between cleaning processes. Vapour condensation of the vapour of the last stage in mixing or surface condensers.